As part of my attempt at taking part in Stash Dash 2014, which I mentioned in the latest podcast episode, I decided to explore some of my older stash. I also wanted to find a way to use up large quantities of old stash that didn't seem to be going anywhere. These are the four yarns I found that; I thought would work well together, I had in large quantities, was fairly robust and had been hanging around far too long. 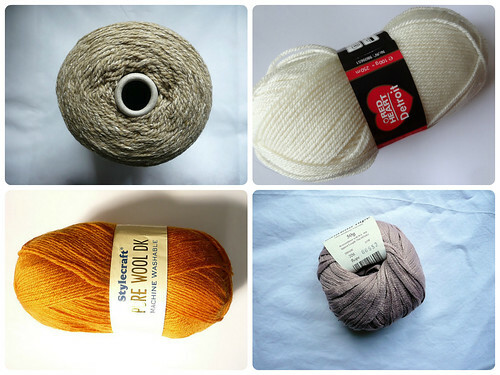 Clockwise from top left, they are; Forsell Touch of Silk DK in the Light Sandstone colourway, bought in 2010, Red Heart Detroit in 00208, bought in 2011, Rowan Bamboo Tape in Rope, bought in 2010 and Stylecraft Pure Wool DK in Saffron bought in 2010 and left over from The Archer hoodie knit in 2012. As you can see, these yarns had been hanging around for a while. 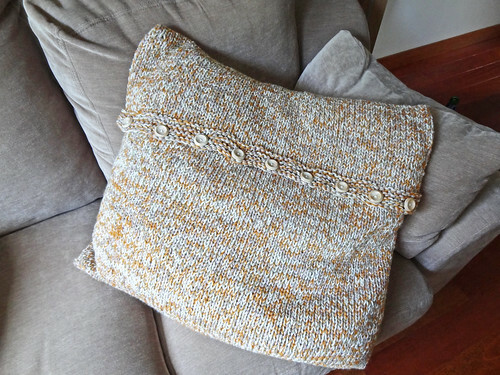 The reason I wanted to have fairly robust yarns was I decided to make a cover for an old beanbag cushion I made a couple of years ago, which I never got round to covering. I wanted to use the covered beanbag as an outdoor cushion to use with a blanket, so it needed to stand up to being thrown around on the grass. The beanbag was a decent size so I knew it would be a good way to kill two birds with one stone, make a cover for the beanbag, so it could be used, and use up lots of yarn. To use up the largest quantity of yarn possible I wanted to use a strand of each yarn, held together on large needles. This would make a thick fabric to protect the beanbag from getting damaged in the garden. 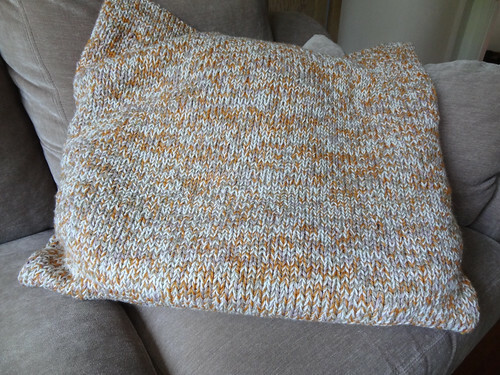 I decided that I would make the cover shaped like a pocket with a flap, so I did a swatch, in the round on 10mm needles and was happy with the results. I measured the beanbag (loosely) and did some maths to come up with a number of stitches I wanted to cast on. I cast on 68 stitches on each needle using Judy’s Magic Cast On, to create a sealed base, like a toe up sock, and knit in the round for 23”. To stop the top edge curling, I did 3 garter ridges on the front half of the stitches and continued in stocking stitch on the back half. After knitting one more round, I cast off the stitches done in garter stitch. 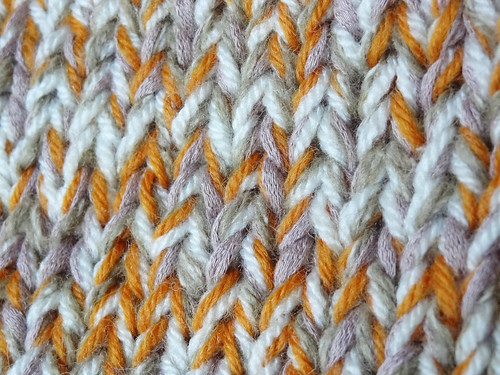 I then carried on knitting in stocking stitch on the remaining stitches, back and forth until the flap measured 10”. I knit 2 garter ridges on the right side, then made 9 buttonholes on the next round. I knit one more garter ridge and then cast off from the right side. To ensure that the flap lay flat and smooth I decided to fix the side edges to the body of the cover, like an envelope pillowcase. To stop the seams being bulky I used one strand of the Red Heart Detroit to sew, using mattress stitch from where the flap attached to the body of the cover, down to the open top edge. I measured the for the buttons I would require by pushing through the buttonhole example buttons from my button jar. 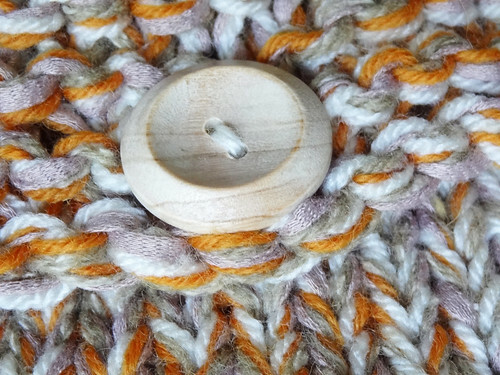 I decided a 30mm button would work best and I bought 9 wooden buttons from Wool Warehouse. 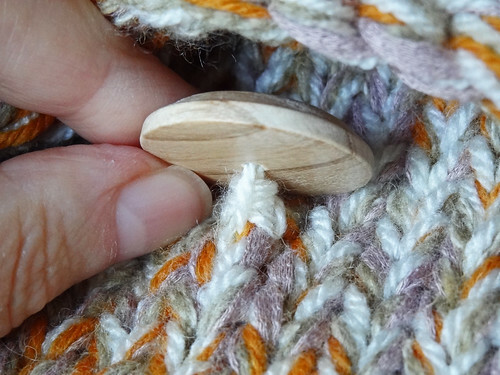 I applied the buttons using the same yarn used to do the mattress stitches and made sure the buttons were far enough away from the fabric by wrapping it four times around the yarn attaching the button, between the button and the fabric it attached to, making a yarn button shank. This meant that the thick fabric of the flap would be able to lie flat, rather than being squashed. The resulting beanbag cover is strong, and flexible enough to cope with the movement of the beans, as the cushion is moulded and squashed into shape. The flap of the cover is neat and secure, on all sides. It should hopefully stand up to hard use without coming loose or gaping. In total I used up 2520m/2756yds of yarn, which goes a very long way towards the total goal of 5000m for Stash Dash 2014. Of course if you listened to the latest podcast episode you will have heard about my own personal goal during Stash Dash. I declared I would go without buying yarn until I have knit 5000m from my stash, excluding the yarn I needed to buy for two birthday gifts. Stash Dash rules allow the total counted to include metres of yarn plied up, after spinning. For the purposes of my challenge I'm going to exclude that because it actually adds to my total yarn stash, rather than using it up! If you want to join in with your own personal Stash Dash goals, come and join me on the dedicated thread on the Ravelry board. I feel that this beanbag cover has made a big dent in my goals of shifting some old stash out of their boxes and into use, however there is still lots of this yarn left over. I'm trying to persuade my partner that all our cushions need new covers, even though this yarn combination doesn't really "go" with our lounge. He's not convinced so I'll have to find another use for it. Maybe I can crochet it into a big basket to store more stash!